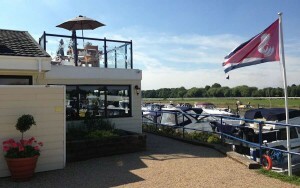 A secret gem of a restaurant is Gogo’s, which though hidden away in the Windsor marina is very popular with locals due to its riverside location and the delicious food they serve at a great prices. 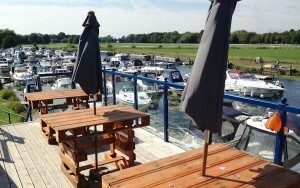 A rooftop dining area has great views over the boats in the marina and the racecourse beyond it. Far from the roads this is an oasis of calm, where the friendly welcome is relaxed and inviting. The seating and tables outside are put together from old wooden palettes, so fans of recycling will enjoy working out how it the chairs were made, but the views and furniture take second place once the food arrives. Fresh meat and fish seemed to be important in the menu although there were a good selection of salads too. We came for lunch and opted for a greek salad and spicy South African beef sausage sandwich. The salad was a good size and had all the right ingredients (although the olives were uninspired) but the sarnie was a great revelation. Absolutely lovely and beautifully cooked it was suffused with a mixture of aromatic spices, the intensity of which grew with every delicious mouthful. This was served with perfectly fried chips, crispy golden on the outside and fluffy within. The next table along had some really good looking grilled fish skewers, served with style, hanging from a stand. We really enjoyed the food and atmosphere and lingered over coffees and baclava not wanting to get back to the office. They are open for breakfasts from 10.00am (9.00am on a sunday) and on a sunny morning there really couldn’t be a better place to start the day. More recently we came on a Tuesday evening and enjoyed a fabulous plate of ribs which were literally dripping off the bones. Very big rib portions served with Chips meant nobody was going home hungry. To get to Gogos (a 20 minute walk from the town centre) you head upstream out of town along the maidenhead road and turn into Windsor Marina which is just after the Windsor racecourse main entrance.